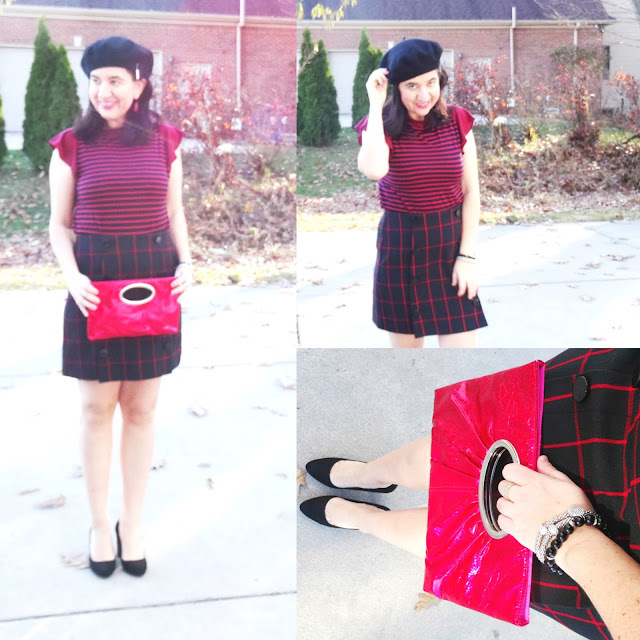 Thursday Moda #91: Plaid Mini Skirts and French Berets. Good morning ladies. 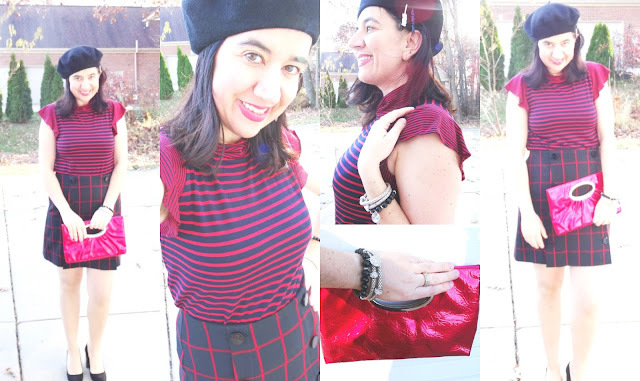 Oh I have got two very fun outfits for you today and they have two things in common: Plaid Mini Skirts and French Berets. Don't you see the French vibes here?! Actually I wore the first outfit (with the Fun Bird Sweater) this Tuesday when our temps were as high as 62 degrees - hence the bare legs. I got a lot of compliments on this look from co-workers, strangers and even some of you who saw peaks of this outfit on my Instagram - those of you who don't follow me, you should =P. I took the opportunity and seized the moment as far as the nice warm sunny weather goes and I decided to shoot a little dressier, different pattern-mixed Red+Navy Outfit for you. But I kept several elements the same for both looks: plaid mini skirts, bright handbags, beret hats and French vibes. So which of these two outfits is your favorite?! I think I like the one with the Who What Wear Asymmetric Wrap Skirt (the first outfit) slightly more. The Gray Classic Plaid Wrap Skirt can still be found at Target from one of my favorite brands ever - Who What Wear. This same classy and elegant pattern also came in a masculine-inspired blazer and some awesome dressy pants - ahh, wish I had the other 2 pieces. The other skirt has this tailored, sleek windowpane pattern and even-though I purchased the skirt at Loft at a different trip than I picked the Striped, Ruffle-Sleeve Tee (also by Loft), I knew that my first time showing these two new closet finds would be to pair them together. My skirt can still be found at some Loft stores on clearance - here - for half off. Also this Patterned Lavender+Navy Skirt is very similar in style and Loft also has a very similar Black+White version. I tend to wear a lot of fun mini skirts around the Holidays as this recent flashback post also showed. Both of these are perfectly festive for this time of year and pretty thick. When it is colder, just pair them with thick tights. This outfit came together nicely with all the pattern-mixing I did between the Estate Print Mini Skirt and those sort of grayish Snakeskin Loafers I purchased for a steal at Banana Republic 2 months ago. It all looked so nicely with the bright pinks I paired these with. 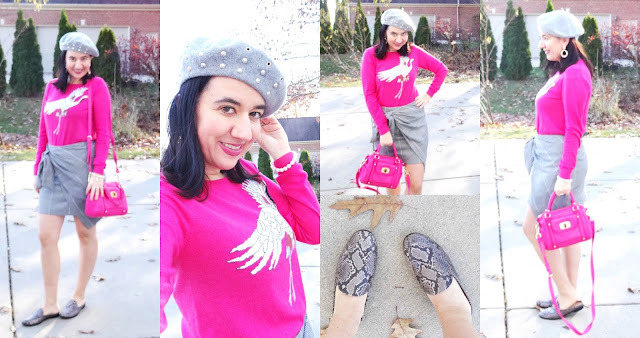 The Fun Bird Sweater (also by Loft - I need to own some of their stocks lol) is what I would call a Raspberry Pink shade while the Faux Leather Bag (but it looks like real leather and it is very well-made) is more of what I'd call a Fuchsia. This Crossbody Satchel I have had for 1.5 years, is from Target, ladies. I have a bigger version of this bag in bright purple, too. I dressed this up with a dark pink/raspberry lipstick, soft blush (I don't always wear blush on my cheeks) and some Gorgeous Crystal Cluster Gold-Tone Hoops. Both the earrings and all the bracelets in these outfits are by The Limited. Last but not least the Grey Beret looked great with all the rest of the grey in this look. 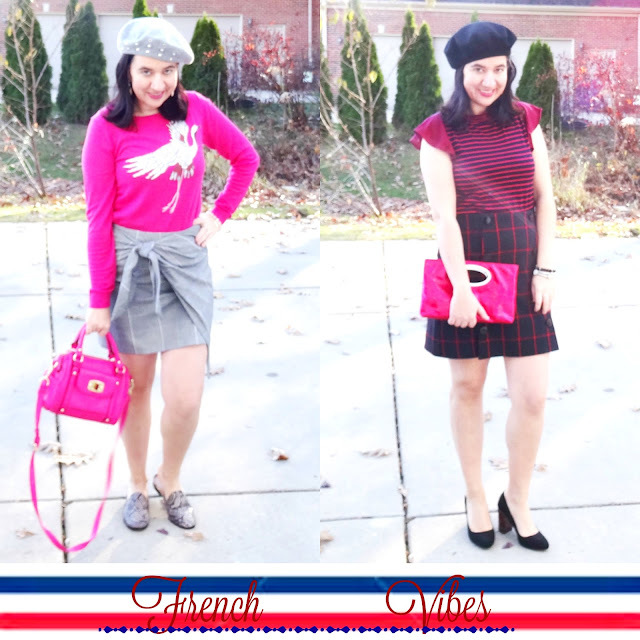 Fun Fact: I have always loved berets and I remember wearing them since I was about Vivian's age. I have had berets in almost every stage of my life. I used to own some as an adult too but then, before I moved to Albania in 2011 for a few years, I got rid of almost all of them - silly me. I still may have 1-2 in my storage here in US - I will have to look. Anyway, I am glad berets are back in style because in my opinion they are the easiest hats to wear and they are so sophisticated, sleek and make you look French - the epitome of class - in literally a second. I am also glad Baker Boy Hats are back - had a few of those too, I have to dig and find some. 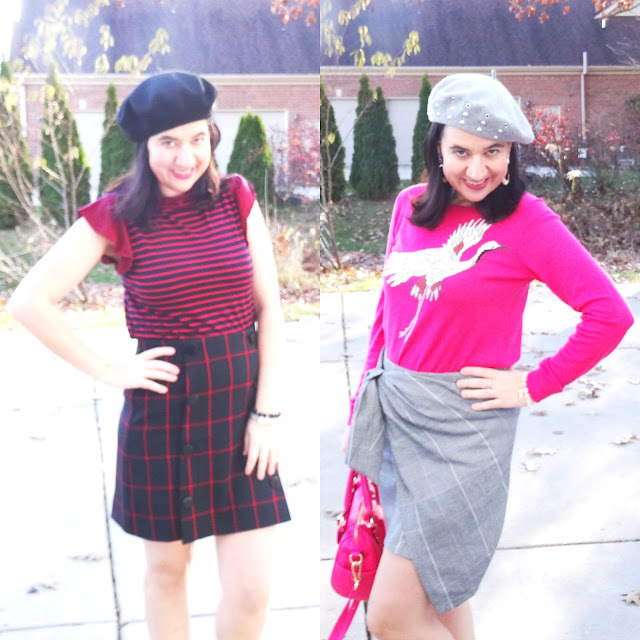 Anyhow, both of these berets are from Target and they are both a steal. I love the Grey Studded Grommet Beret - grey is my favorite neutral and plus those grommets are fun. While the Black Beret is as classic and simple as berets go. Both of mine are from the new line "A New Day" and Target has at least a couple of other styles of these berets too - check the out! And check out those fun French-saying barrettes. They say "Merci" and "Bonjour". I like how they sort of decorate the beret too and from afar they look like mini pins/brooches. Yes, I paid attention to the smallest details. I mention this always but it is those little details that can make or break an outfit. I love how this outfit turned out. Like I said the windowpane skirt and striped tee are meant to go together. I feel like they are the same exact shade of navy and the same exact dark shade of red. This is more of an evening look, though it can totally fly in an office too (minus the beret and I'd probably add tights too - though it depends on the weather). The Faux Suede Block Heel Pumps by Target have the best tortoise-shell heels and they are so classy and comfy. I also accessorized with a Red Patent Leather Clutch and since I added a few bracelets and those little French Barrettes I kept the earrings simple. 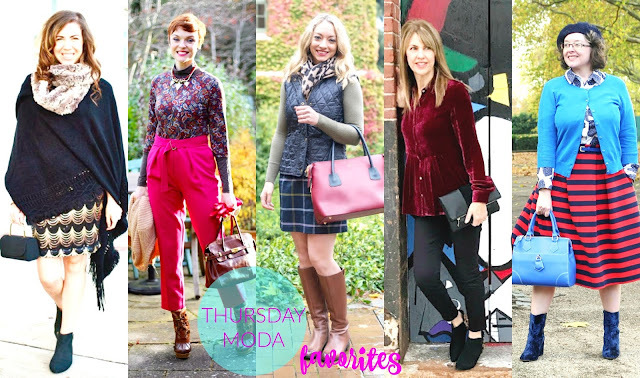 To make this outfit even better-suited and warmer for December I'd wear black opaque tights and a black fitted or semi-fitted velvet blazer. I can picture you looking super chic! 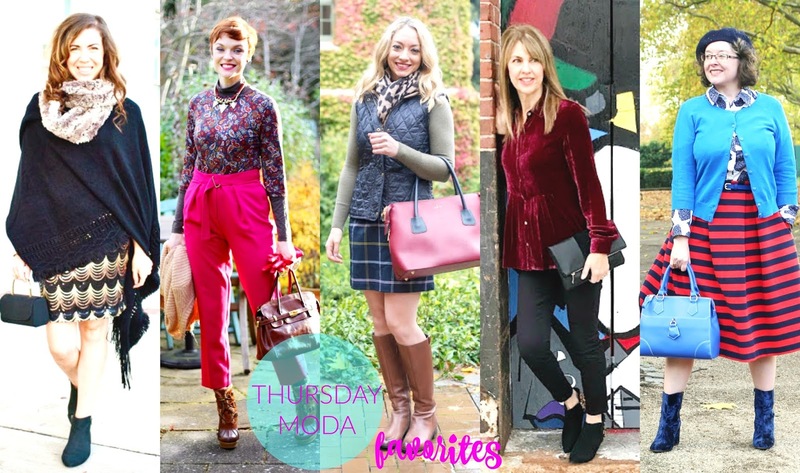 Even-though it was Thanksgiving last week, over 80 outfits were linked and I saw so many beautiful color combinations for Winter and so many great cold-weather textures. I must say these ladies nailed the layers. And my friend Amber is even wearing a similar dark plaid mini skirt. For two weeks in a row now, the 30+ crowd killed it! In 'The First Look of Christmas', Jamie took a gold+black sparkly dress and styled it 5 ways. This look with the chic black fringe poncho and fun little bag was my favorite, though all outfits were nice. 'Peg Leg Trousers and Platform Hiking Boots' look extraordinary on Samantha. If that street is her runway, she nailed it. Love the patterned turtleneck and necklace, too. 'Leopard and Plaid' are perfect for Fall and Winter and Amber knows it. Her sleek leather tote, classic cognac flat boots and quilted vest are great outer accessories. The 'Velvet Shirt' comes in all kinds of styles and colors now, but there is something about cabernet velvet that makes me have heart eyes. Jacqueline is 'Pattern Mixing a Midi Skirt' while color-blocking red with cobalt. 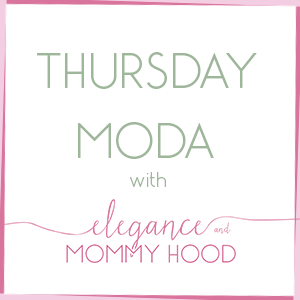 Stunning and trendy head to toe and it worked!